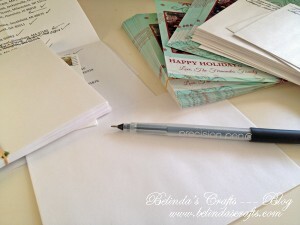 Working on my Holiday cards. Somehow Thanksgiving coming later really messed up my usual punctual delivery of our Christmas cards. We took the boys to take our family photo before Thanksgiving but I am just now sitting and writing them. I decided last year that instead of hand making all of my Christmas cards, we would sit for a photo and have photo cards made and make a handful of homemade cards. So I am very happy to say that the first batch of photos will go out in the mail later today! That’s one thing off my checklist. I hope you are all checking things off your list! I’ve almost finished with my cards for this year. 18 more to finish up and I’m done! yay! I like the idea of a family photo card. I know I always enjoy receiving those from my friends and family.